Magdalena Salazar-Palma was born in Granada, Spain. She received the MS and PhD degrees in Electrical and Electronic Engineering from Polytechnic University of Madrid, Spain, where she has been Assistant and Associate Professor at the Department of Signals, Systems and Radiocommunications. Since 2004 she is with the Department of Signal Theory and Communications, Carlos III University of Madrid, Spain, where she is Full Professor, co-director of the Radiofrequency, Electromagnetics, Microwaves and Antennas Research Group (GREMA) and served for three years as Department head. She has developed her research in a number of areas: electromagnetic field theory; advanced computational and numerical methods for microwave and millimeter wave passive components and antennas analysis and design; advanced network theory, in particular, passive devices, filters and multiplexers theory and design; antenna arrays and smart antennas; novel materials and metamaterials for the implementation of devices and antennas with improved performance (multiband, miniature size, and so on) for the new generation of communication systems; design, simulation, optimization, implementation, and measurement of microwave circuits both in waveguide and integrated (hybrid and monolithic) technologies; millimeter, submillimeter and THz frequency band technologies; radio waves propagation theory; and history of telecommunications. She has authored or co-authored 694 publications: 7 scientific books and 30 book contributions published by international editorial companies, 14 academic books, 103 articles in scientific journals, 370 contributions for international symposia, 78 papers in national conferences, 53 project reports, 30 short courses notes, and 9 other publications. She has coauthored 2 European/USA patents and several software packages for the analysis and design of microwave and millimeter wave passive components, antennas and antenna arrays, advanced filters and multiplexers, which are under exploitation by multinational companies. She has participated (as principal investigator or researcher) in a total of 93 research projects (43) and contracts (50) financed by Spanish, European, and USA public institutions and companies. She has delivered numerous invited presentations and short courses. She received two individual research awards, and together with her Department another research award. In 2016 she got an Honorary Doctorate from Aalto University, Finland. She has received several grants and other awards and recognitions, among them the elevation to IEEE Fellow. She was the lecturer of the Inaugural Lesson of the Academic Year 2015-2016, Carlos III University of Madrid (the video recording of the opening ceremony may be seen here, with the inaugural lesson going from minute 44 to minute 78). Recently she was interviewed by the journal BIT of the Spanish Official National Association of Telecommunication Engineers, COIT, with the interview announced in the front cover of issue 202. She has been member of Spain Accreditation Committee of Full Professors in Engineering and Architecture and other accreditation panels for institutions in Spain and abroad. She has assisted several Spanish agencies in the evaluation of projects, research grants applications, and so on. 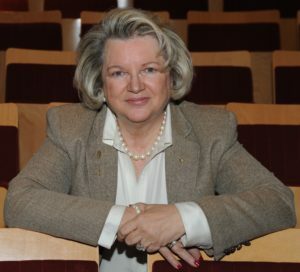 She has served in evaluation panels of the Commission of the European Communities, and other countries, including the National Science Foundation in USA. She has been associate editor of several scientific journals, member of the Technical Program or Organizing Committees of many international and national symposia, and reviewer for many international scientific journals, symposia, and editorial companies. In 1989 she became member the Institute of Electrical and Electronics Engineers (IEEE) and was elevated to Senior Member in 2001. In November 2013, she was elevated to IEEE Fellow “for contributions to the application of numerical techniques to electromagnetic modeling”. She is member of IEEE Antennas and Propagation Society (AP-S), Communications Society, Education Society, Magnetics Society, Microwave Theory and Techniques Society (MTT-S), and Women in Engineering (WIE). Since 1989 she has served IEEE under different volunteer positions: Vice-chair and Chair of Spain Section AP-S/MTT-S Joint Chapter, Spain Section Chair, Spain Section Membership Development officer, Spain Section Professional Development officer, Spain Section adviser, Region 8 Committee member, Region 8 Nominations and Appointments Subcommittee member, Region 8 Conference Coordination Subcommittee Chair, Women in Engineering Committee (WIEC) member, Chair of WIEC, member of Ethics and Member Conduct Committee, History Committee (both, IEEE Board of Directors Standing Committees), MGAB (Member and Geographic Activities Board) Geographic Unit Operations Support Committee, elected member-at-large of AP-S Administrative Committee, and member of Division IV Nominations and Appointments Committee. In 2009 she was elected as 2010 AP-S President-Elect, serving in 2011 as 2011 AP-S President and member of the Technical Activities Board (TAB), and, in 2012, as AP-S Past President, Chair of AP-S Nominations Committee and Chair of AP-S Past Presidents Council. She has also been member of AP-S Nominations Committee, Distinguished Lecturer Program Committee, and Chair of the AP-S Constitution and Bylaws Committee. She has been General Chair of MGAB Sections Congress 2014, member of TAB Society Review Committee, member of the IEEE Service Awards Committee (IEEE Awards Board), and TAB Leading Representative at the Joint MGAB/TAB/EAB (Educational Activities Board) AdHoc Committee on Member Development. Currently, she is member of the Honorary Membership Committee (IEEE Awards Board), TAB Nominations and Appointments Committee and TAB Hall of Honor Committee. She is also voting member of MGAB (as TAB representative), 2017 Sections Congress Committee, SIGHT (Special Interest Group on Humanitarian Technologies) Communities of Practice Subcommittee, and IEEE Fellow Committee. She is also member of the Region 8 Strategic Planning Committee. Within AP-S she is member of the Constitution and Bylaws Committee, Field Awards Committee, Meetings Committee, New Technology Directions Committee, and Chair of the History Committee. She is member of MTT-S Technical Committee # 15. In 2014 she was elected member-at-large of MTT-S Administrative Committee, where she is serving as member of the Education Committee, Image and Visibility Committee, MGA Committee, Operations Committee, Publications Committee, SIGHT AdHoc Committee, and Vice-chair of Intersociety Liaison Committee.